Is your crippling student loan debt keeping you from becoming a homeowner? 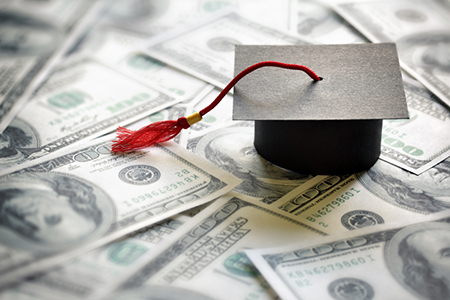 According to an article by RefinanceStudentLoans.net, “The Case for Student Loan Forgiveness,” student loan debt is one of the highest debt categories in the U.S., coming in second to only mortgage debt. Add up the debt from the 44-plus million borrowers in the U.S. and it comes out to a whopping $1.44 trillion, the article reports. If you’ve experienced a hefty monthly student loan payment, then you’ll understand why borrowers are less likely to boost the economy. If all of your cash is going to bills and debt reduction, there’s no excess money to spend. This loan debt can also delay important life events—such as getting married, having children and buying a house—by 19 to 46 percent. Many are having trouble affording these loan payments after paying for rent, gas and utilities. According to the article, 8 million borrowers defaulted on their student loans as of 2016. Fortunately, there are some resources available that can ease the burden of student loan debt or erase it completely. Programs such as Public Service Loan Forgiveness and Perkins Loan Cancellation can help you if you work a non-profit, education or government job. If you don’t qualify for these, you can also apply for income-based repayment plans to lower your monthly loan payments or defer them for the time being. The following infographic, provided by RefinanceStudentLoans.net, offers a breakdown of available student loan forgiveness and alternative repayment options.